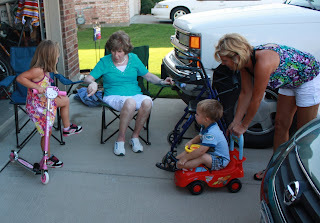 MeMaw and Aunt Suzie came over on Thursday night to celebrate the kids birthdays early. I tell you, this month is crazy...we have so much going on. So we are having several different celebrations. It is hard to get all the family together at one time. 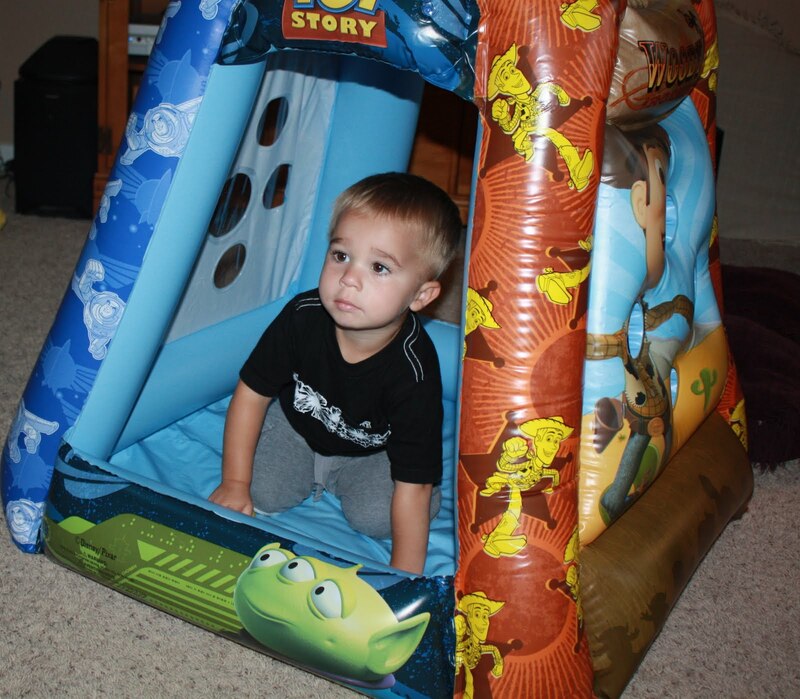 and Hayden a mini bounce house filled with balls. Here is Layla, showing MeMaw her Ouchie. 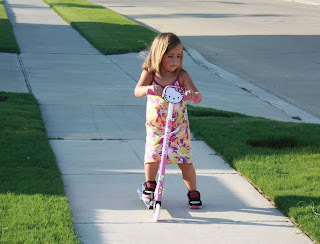 She fell learning to ride the scooter. But she is ok! She loves that thing. She has been asking for one for weeks. 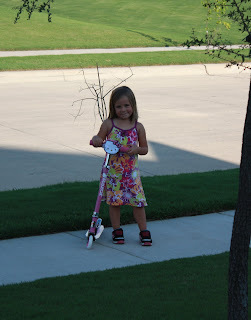 Her best friend has one and she learned to ride at her house and begged us to get her one. Hayden was all kinds of wanting a ride on toy. So we went inside and got his Lightning McQueen car he got last year for Christmas. 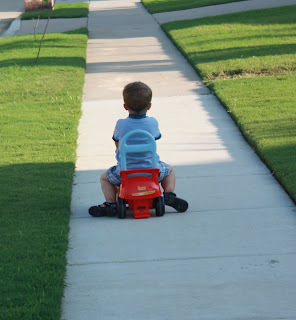 Then he was just like Layla...cruising the sidewalk. 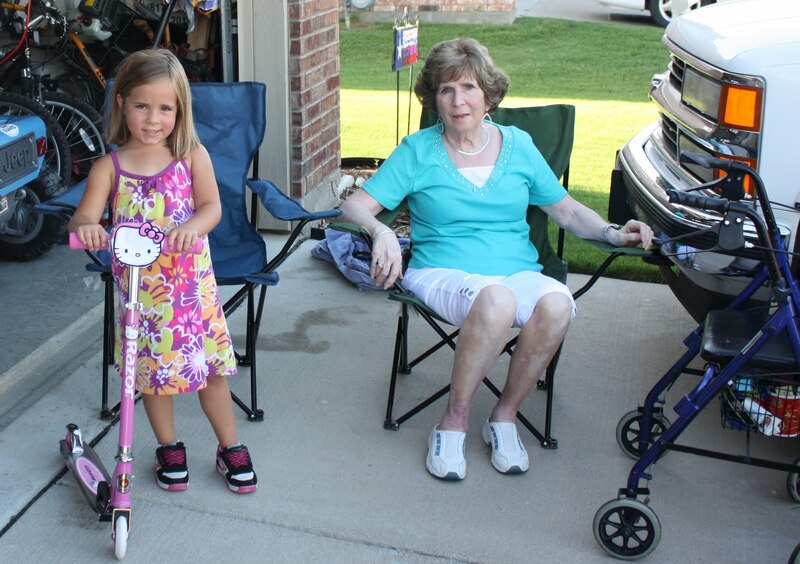 Layla and MeMaw with their scooters. HA! And this is what the bounce house looks like now. 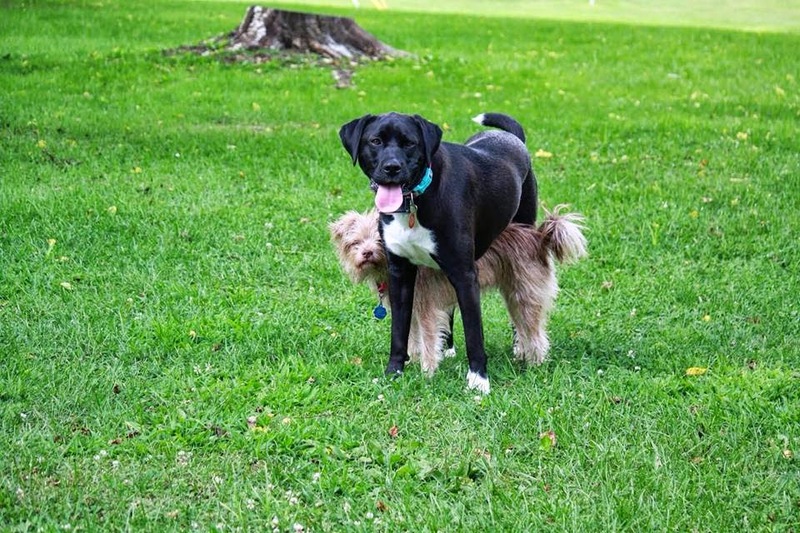 It is a tent/chair/wrestling partner. 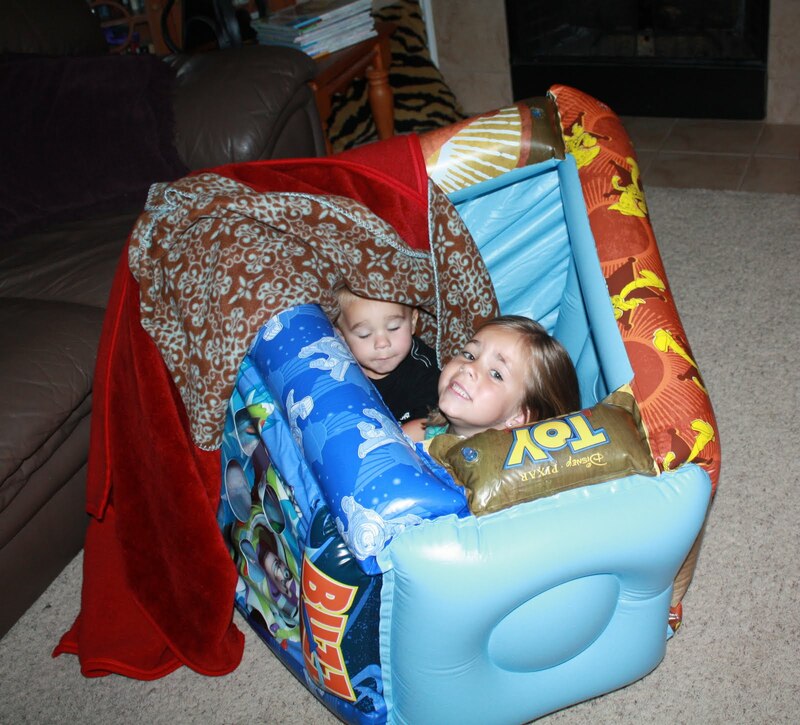 Sheesh...these kids have some crazy ideas, but at least they are playing nicely together! Thanks Aunt Susan & MeMaw...We love you!! That last picture cracked me up! I swear that looks just like something my kiddos would do! Eli loves Woody too:) Anytime he sees anything to do with Toy Story he says Woody! What a great little birthday celebration. I love to watch my kids and their new outside toys. 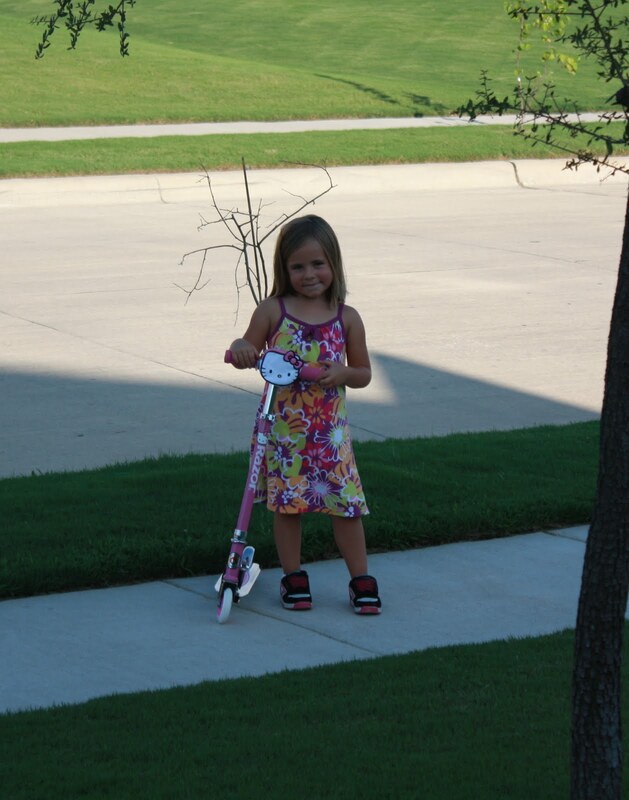 We need to get a bike for Jamison...a bigger one. 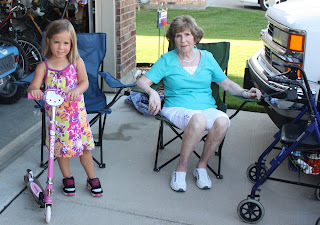 I love the picture of Layla and MeMaw and their scooters! As long as they are having fun, thats most important! How fun! Isn't this weather perfect right now? Not too hot and the kids can actually play outside without 54 layers of sunscreen! Love the bouncehouse turned tent! I love her scooter, Emily would love it too! ;) Alex's birthday is Tuesday...he will be 8! Seriously...where does the time go?